West Wye Valley lies in the community of Llangurig in the county of Powys. It is located at Ordnance Survey national grid reference SN82328465. The mine is recorded in the CPAT Historic Environment Record as number 8474 and this number should be quoted in all correspondence. Silurian Frongoch Formation. The veins trend on a NE-SW strike and are part of an extension of the Castell vein to the west. Mineralisation includes lead, silver and zinc. The western workings consist of two shafts at SN82138453,SN82458478 and an adit at SN82468480. 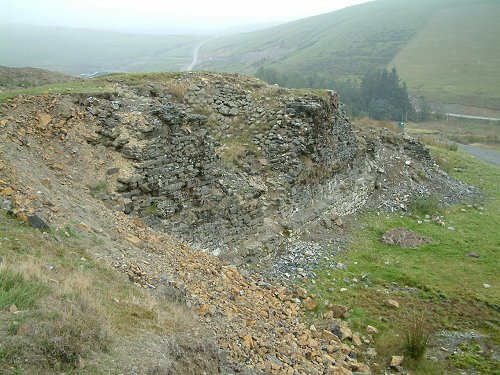 Short stretches of tramway extend from the shaft to the spoil heaps on the western mine. The 1869 pumping, winding and sawmill waterwheel was supplied by a leat from the Cyff Brook on the western side of the River Wye. A 30ft wheel powered the crusher. A large reservoir is located at SN83158521 which supplied water to the dressing floors. The western dressing floors had the usual range of ore bins, a crusher, jigs and buddles. A small reservoir is present. The present remains are poorly preserved at basal foundation level. Four miners cottages were built in 1876 on the western mining area. Traces of the foundations can be seen. There are also remains of a mine office and possible smithy/carpenters shop.